Speculations are rampant, but it seems that no one can say for sure what mysterious force or event recently cleaned the solar panels of the Mars rover Opportunity. 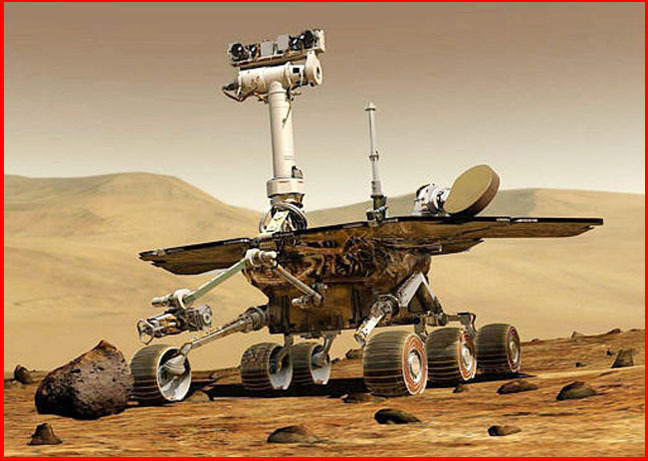 The rovers Spirit and Opportunity landed on Mars in January 2004. When their missions began, their solar cells were providing 900 watt-hours of electricity per day. But over the months that followed Spirit's output dropped to 400 watt-hours daily, while Opportunity dropped to about 500 watt-hours. One reason for the drop was the accumulation of dust on the panels. But then, in one of the great surprises of the rover missions, Opportunity's power began to increase, and kept on increasing until the power peaked at just over 900 watt-hours! As reported by Newscientist.com, the Mars rover Opportunity "stumbled into something akin to a carwash," which somehow "cleaned" its solar panels. Jim Erickson of NASA's Jet Propulsion Laboratory admitted that the cause of this surprise "cleaning" could not be explained. "These exciting and unexplained cleaning events have kept Opportunity in really great shape," Erickson said. The remarkable cleaning occurred in spurts during the Martian night. The team managing the rover reports that on at least four occasions over a six-month period, the rover's power output suddenly increased by up to 5% in a single night. Some suggested that the Martian winds might have swept the dust off the panels. Others wondered if frost could have caused the dust to clump, exposing more of the panels. And some even suggested that the tilting of the rover while climbing hills might have caused a portion of the dust to drop off. Such guesses are unnecessary, say advocates of the Electric Universe. Winds alone do not clean dust from smooth surfaces, even on Earth, where the atmospheric density is one hundred times that of Mars. Tilting a dusty surface does not clean it either! The discovery that dust devils on Earth have strong electric fields suggests that dust devils on Mars, ten times larger than their terrestrial counterparts, have the power to "burn" the dust in their tracks. After years of being scorched and drifting about, it's no surprise that the surface dust of Meridiani Planum is black. That dust also is likely charged with static electricity. Just as static electricity can stick dust to an object, it can remove dust. "Electrostatic cleaning" is a common and effective industrial application. All that's needed is to change the voltage. It seems that the rover team missed the best clues. They found that the most marked cleaning episodes occurred when the rover was climbing the rim of Endurance crater, but they missed the connection to electrostatic cleaning effects--despite the fact that many of their own scientists are already aware of the strong electric fields in dust devils. Such oversights as these have created much humor among advocates of the Electric Universe. They will tell you that the conventional blindness to electricity in nature has scientists groping for explanations with their backs turned to the facts.